Chan Chan ruins—they’re melting | Where to next? We’ve had several touristic stops in Peru including the Lord Of Sipan Museum, the Temples of the Sun and Moon, and one at Chan Chan, the largest pre-Colombian city in South America. Of course it’s not a city anymore, but a huge archaeological site not far from Trujillo on the Pacific coast. Our guide, who had been studying English for only five months, did a so-so job of explaining what we were seeing. Actually he did quite well for so little experience, and he’ll get there soon. But for us, he knew his spiel by heart and delivered it as fast as he could. In spite of that speed event, I’ve been able to learn a bit more from travel books and such. In its heyday, Chan Chan was an imperial capital for the Chimu civilization. It covered 20 square kilometres and had about 30,000 residents. It had an enormous network of irrigation canals. 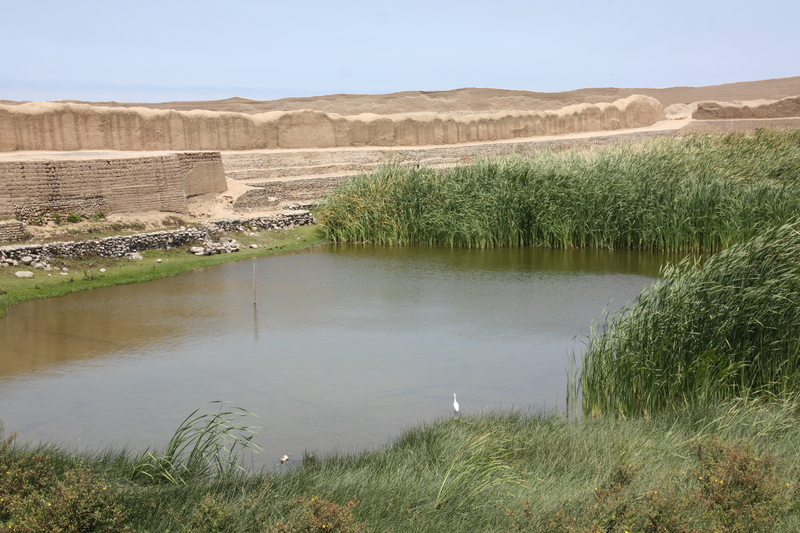 Even though Chan Chan sits in the midst of the desert, there is still a half-full well from ancient times. Having been built from abode brick around 850AD, Chan Chan survived until it was conquered by the Incas just over 600 years later. But the invading Incas were not the last of Chan Chan’s problems. Today the city’s ruins are at the mercy of Mother Nature—earthquakes, storms and flooding—and looters, although I think it is rather well guarded now. But the structures themselves are suffering. There is a labyrinth of walls, pathways and cubicles. The adobe walls give the impression that they are melting. For starters, many have lost much of their height. While the wonderful designs—such as fish and other sea creatures, birds and geometric shapes—are still visible, you can see they are deteriorating. Roofs have been erected over some particularly vulnerable and/or decorative areas. A conservation plan is in place. Chan Chan has been a UNESCO World Heritage Site in 1986. Thanks for dropping in and for the positive reaction.